The modernization at W.R. Myers High School and D.A. Ferguson Middle School is still rolling along and looks to continue to do so for most of 2019. During Horizon’s regular board meeting on Jan. 23, trustees got another look at where the Alberta Infrastructure-led modernization was during the first part of 2019. “It’s going, it’s not necessarily going as fast as we want it but it is happening. It looked like we were supposed to be done and D.A. Ferguson would be back in by the end of February. The contractor is still saying that. Jake (Heide, facilities manager) has a meeting with them tomorrow (Jan. 24) and he assumes that is what they will say, but he is very skeptical,” said Bruce Francis, vice-chair of the Horizon board of trustees. 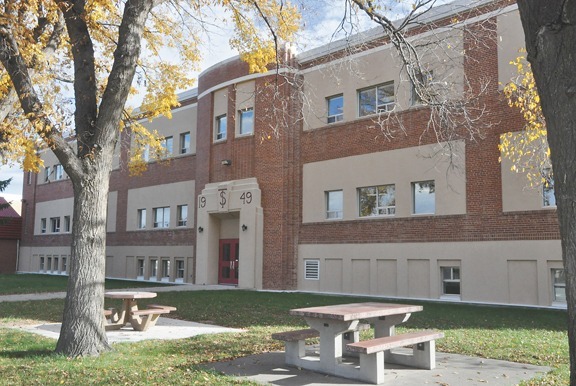 The partial modernization project for the two schools has experienced delays since beginning in 2018 and was originally supposed to see completion sometime this summer. While those delays have been fairly evident, work has continued to progress inside the walls of the two schools. The board of trustees were presented with a slideshow of photos highlighting work being done in both W.R. Myers and D.A. Ferguson. “In a lot of the classrooms they have one or two walls already painted with one coat,” said Wilco Tymensen, superintendent of schools, in regard to D.A. Ferguson. Other areas being worked on in D.A. Ferguson includes the painting of the gym ceiling, painting of gym walls and an added storage facility. With the board being able to see some of the visuals, they were reminded the project was a partial modernization and not a full modernization. While they are optimistic D.A. Ferguson would be back in their building, they also realize how much work is left. In terms of the overall project, patience is being preached as they continue to work towards completion. It was pointed out that change orders on a variety of internal projects has also been a reason for some of the delays. Even though the progress has been slow, Horizon administration says they are happy with how things have been dealt with. “Both school administrations and Jake have commented that they (the contractors) have been really good to work with. They are responsive but there are things that take time. They want to make sure they are doing things well and doing things properly. When they come across things that aren’t on the plan and they go ‘to do this properly we need to do this,’ well that is a change order and you need provincial government approval because they are managing it,” said Tymensen. In terms of the financial side of things, spending has reached right around the midway point so far. “Approximately 50 per cent of the project’s contingency allowance has already been spent,” explained Francis. While this may seem excessive, Tymensen stated he thinks that would be typically normal in other projects as well. “The objective is to use 100 per cent of it, right?” he added. While the board had hoped the gym at W.R. Myers would be ready for this past weekend’s Rebel Classic basketball tournament, that was not the case. Games for both the girls and boys draws were scheduled for gyms at Central School, Barnwell School and St. Mary School.